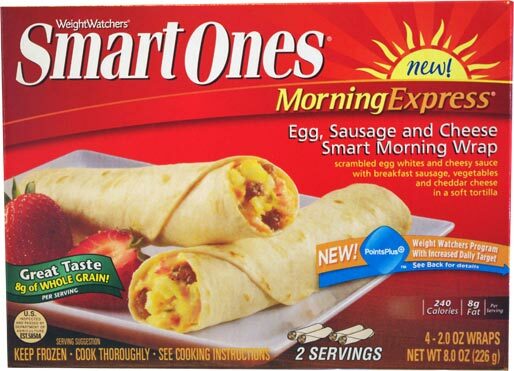 The complete name of this product is Smart Ones Morning Express Egg, Sausage And Cheese Smart Morning Wraps... such a long name for such a small, yet SATISFYING breakfast item. 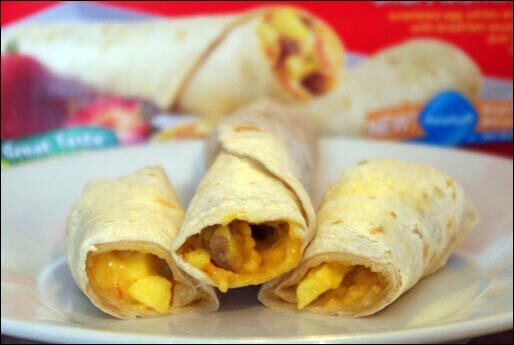 They're basically appetizer-size breakfast burritos. Two 4" x 1" wraps make a single serving. Everything tasted and felt like it should... that's pretty high praise for any frozen breakfast entree. No synthetic egg texture. No near-meat flavor. The eggs tasted like eggs. The cheese was pleasingly cheesy. And the sausage was particularly delicious. Sprinkled among the key ingredients were bits of red pepper which gave the wraps a lively, fresh kick. My only criticism is that the tortilla is just slightly on the chewy side. But that's nit-picking. This is a good product. It tastes good. It fills you up. And it appeases the part of your brain that craves eggs for breakfast. Nutritional Concerns: Each 2 piece serving has 240 calories, 8 grams total fat (2.5 saturated and 0 trans), 32 grams total carbs, 7 grams dietary fiber, 2 grams sugar and 11 grams protein. 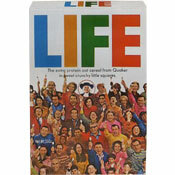 One note: The instruction on the package direct you to microwave 2 wraps for 65 seconds. I found the centers still a bit cold in that time. I had better luck with a microwave time of 75 seconds. 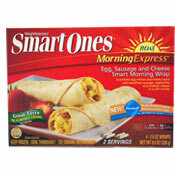 What do you think of Smart Ones Morning Wraps? I love these but I cannot find them anywhere anymore. Very much enjoyed. Great for a quick and easy breakfast! These wraps were delicious, quick to fix and for only 6 points on "Weight Watchers Points Plus" were a very satisfying breakfast. Much better than their French Toast or Breakfast Muffins. These are the ones to get. I also recommend the Smart Ones dessert items.